You'll be £8.00 closer to your next £10.00 credit when you purchase Bastogne. What's this? By Christmas 1944, the Allies were on the threshold of victory, having remorselessly rolled the Germans back to the very borders of "The Fatherland". The, the shock of a massive Nazi counter-attack through the Ardennes in the depth of winter threw the Allies into confusion. 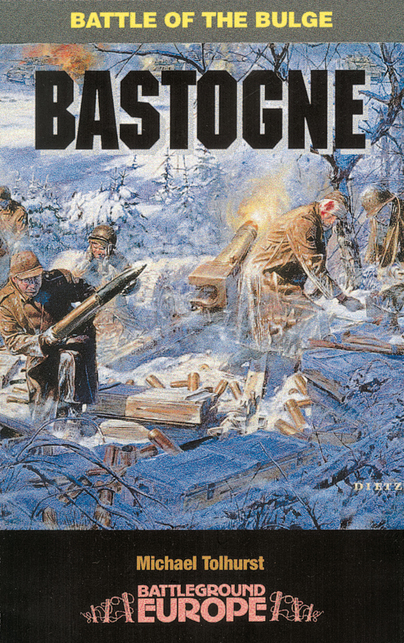 Bastogne was at the very centre of this dramatic and most dangerous setback. This is a great little book especially for new researchers and people otherwise interested in World War 2 and Theatre Europe in particular. It provides a very concise and interesting overview and time line of what happened during those December days in 1944 in Belgium, Germany and Luxemburg. The Battle of the Bulge, and more in particular the Battle for Bastogne, a tiny town in the Belgian Ardenne forest, was part of the last major German offensive of the war and fought in bad and cold winter weather, with an allied side rather unprepared, but very determined. I really liked it for the explanatory style it uses, accompanied by clear maps and lots of photos. The factual text is interspersed with quotes from people that were directly involved in the actions, from both sides. The quotes and parts of diaries are there to emphasize certain actions and show the various views by participants, but this is not a 'atmosphere' like description of the battle(s). I have travelled the area extensively myself these past 50 years and the nice thing about it that nothing much has changed since those December days. Walking the forests and overlooking the hilly terrain, it is very easy to imagine how the battles must have been fought and how things must have looked to the soldiers in those days. If you are interested and ever have the chance, I can really recommend visiting the Ardennes in winter and envisage how it must have been to fight there in cold weather with scant winter clothing and loading your M1 with frozen fingers, facing the German armour and infantry. Use this book as a guide and follow the trail of the Germans and/or the trail of the US battle groups and be in awe. The book covers the German plan and the Allied dispositions in the area before going through the events of the attack, the initial successes, the siege of Bastogne itself, and then the relief of the town and the eventual retreat of the German forces along with the failure of the accompanying German aerial attack, 'Bodenplatte', launched on 1 January 1945 but which used up some of the last vital Luftwaffe resources, in terms of fuel, aircraft and of course pilots. The story of the events are accompanied by numerous personal accounts and archive photos, along with maps and unit dispositions throughout. The final section gives details of what you can find in a tour of the area, one which really needs a car, as public transport won't take you to everywhere you are likely to want to visit, and these notes are tied in with references to pages in the book which tell you what happened in these places, and the parts they played in the story.